Whether we want to improve education or cut crime, to enhance public health or to generate clean energy, science is critical. Yet politics and public life too often occupy a science-free zone. Just one of our 650 MPs is a scientist. Ministers ignore, and even sack, scientific advisers who offer inconvenient evidence. The NHS spends taxpayers’ money on sugar pills it knows won’t work, while public funding for research that would boost the economy is cut. Groundless media scares, taken up by politicians who should know better, poison public debate on vaccines and climate change, GM crops and nuclear power. In this agenda-setting book, Mark Henderson builds a powerful case that science should be much more central than it is to government and the wider national conversation. It isn’t only that scientific understanding is passed over as decisions are made; the experimental methods of science aren’t applied to evaluating policy either. Politicians, Henderson argues, pay lip service to science for a very simple reason: they know they can get away with it. And that will change only when people who care about science get politically active. It’s time to mobilise the geeks. Something is stirring among those curious kids who always preferred sci-fi to celebrity magazines. As the success of Brian Cox and Ben Goldacre shows, geeks have stopped apologising for an obsession with asking how and why, and are starting to stand up for it instead. The Geek Manifesto shows how people with a love of science can get political, to create a force our leaders can no longer afford to ignore. The geeks are coming. Our countries need us. Pre-order the book from Amazon.co.uk today. Long time no see, how are things going? It would appear that we are both doing our best to promote geek activism, although I’m trying to do it with my films. Drop me a line sometime as I’m working on the development of other science documentaries and I would love to collaborate with you on something. I would like to organise some kind of appeal for money or volunteers to buy 650 copies and deliver them to every MP in the house of commons. It’s just an idea at the moment but I can see 2 ways to do it. I would like to know how you would feel about the idea. Is someone else already doing it? Any other comments, or ideas, would be much appreciated. The book is brilliant, and inspiring. I think this would be a brilliant idea, and one that I’d wholeheartedly support. Another way you could do it is via an online community tool such as Pledgebank — get 650 people each to pledge to buy a copy and send it to an MP. Just checking in v quickly here, but will also have a further think. I took a look at the pledgebank site, and I really like it. Their philosophy seems to match with the book very well. If you are OK with it I will set up a page and start promoting it at the weekend. If, or rather when, I have our 650 volunteers do you think we could setup something with Amazon, or your publishers, to deliver all the books to the House of Commons? I think we could get some publicity that way, get geek-friendly MPs like David Willets to come out and collect them? Get the pod delusion guys to cover it? Mainstream press and TV? Glad to see the book is getting some positive press coverage. Everyone who has read their own book already, and has now read this thread/comment sends their pre-read book in to their local MP, independently, with a personal letter (and this is key) detailing why they should read this book. Some MP’s would recieve more copies of this book than others (and several personal letters), but this may be more beneficial, we dont know how many other books are being sent to MP’s. Rather than every MP getting one book and potentially talking to one another thinking it’s a general, untargetted stunt not worth their time, or only reading a summary, some will get 10 or more and have to give it the time it deserves. Some may not read it but rave on to others about how they have been influxed with these orange books. Others will recieve none and ask what it is they are talking about. This may make those who recieved none buy their own or at least look it up. I’m near the end of mine and it’s going to Jesse Norman of Herefordshire. 3) Impact from the moment Jesse Norman recieves my book. That you view Brian Cox as a noteworthy scientist tells me all I need to know. I’m all for science to be key in policy making. However, science and scientists themselves have become watered down and politicised to the extent that they do not understand what the fundamentals of real science require. Next you’ll be telling me the Royal Society is still a respected community for respected professionals applying unbiased scientific rigour. “Thatcher’s Iron Stiletto” ? – nuff said. A rather creative interpretation of that sentence there, since it doesn’t mention anything about Brian Cox being a noteworthy scientist. Although he is noteworthy, and a scientist. You do realise Prof. Cox does *actual research* at CERN and has published it, right? You don’t get to be a professor in particle physics just for being on pretty telly programmes and having been in a pop rock band previously. I am keen to read this book and went looking to buy it today. Unfortunately, as a geek, I now only buy DRM-free ebooks. When will there be a DRM-free EPUB version? I will buy it as soon as it is released (is this a use for Pledgebank as well?). Understand your point. I don’t know whether my publisher has plans for this or not, but will attempt to find out. Do you know when the book will be available in Canada? I think it should be out — certainly my publisher has Commonwealth rights. I’ll try to check this. This is a terrible example. Humans are not purely rational-beings and therefore it would be irrational to act as though they were. Sugar pills are a cheap way to create the demonstrably medically effective placebo effect as well as a cost-effective and efficient way to deal with other patient management issues. I am all for a scientific manifesto but only one that makes a clear distinction between what science as a profession is interested in and the scientific method in policy. One that realises that no risk demonstrated is not the same as risk free. One that understands the risk implicit in complex novel chemicals developed in laboratories and is therefore not confusing the scientific method with simply the novel and the complex. One that understands the distinction between Science the area and methodology which is inherently objective and science the profession and scientists who being human are inherently flawed and subject to self-interest and bias (as we all are). Scientists may adopt a procedure that attempts to root out bias but this is not a technique that guarantees objectivity at any point in time. All of which provide well paid jobs in exciting areas of research but whose delivery in the marketplace is fraught with issues not entirely confined to science and certainly not able to be resolved by the science community alone. How odd – a book about the need for truth and accuracy is making misleading statements on its blog. You say at the start of the blog: “Just one of our 650 MPs is a scientist.” Don’t medical doctors count as scientists? They are trained in the scientific method and how to conduct trials. There are several medical doctors in the Commons and I’ll bet there are other scientifically trained MPs such as engineers, chemists, dentists etc. I totally agree with your aims but it is incredibly sloppy and misleading to claim there is only one scientist in the Commons. All depends how you draw the line. But there’s only one MP with a science PhD who’s also worked as a researcher. It’s not really right to include medical doctors automatically, as few medical doctors also do research. I am told that the figure for science undergraduate degrees (which would include medical doctors) is 27, though I have been unable to source this myself and so am reluctant to rely on it. It will be around that mark, anyway. By contrast, there are 86 lawyers. An excellent idea I will buy a copy, read it first then send it to my constituency AM or, if I find she has a copy, then to one of my four regional AMs. Is this arrangement compatible with the “pledge campaign” ? Matt Bourne is right about the “sugar pill” example, placebo effect is scientifically established. I am campaigning to stop the Wales NHS spending £1.3 million per year paying religious clerics. We believe they should be paid by a charitable trust and the money which is saved spent on scientifically verified, clinically effective medical and nursing treatment. You frequently refer to the use of RCT’s in health research and that they should be applied to other areas of public policy. I don’t think you have properly explained what happens to the control group in modern RCT’s. In most RCT’s the control group is given the best known treatment currently in use. It’s important to make that distinction, the control group is not left to suffer. They are closely followed and often at the end of the trial, if it looks promising, they are offered the intervention. The groups may also be switched part way through the trial. My point is that RCT’s can sound frightening to some, in my experience as a medical doctor participants are happy to be a randomised subject, knowing they will receive some care, even if it is only a telephone call once a month to ensure that they are OK. I am on the last couple of pages of the book now and am delighted to award it 2.9 Cheers. We differ on a few points but agree on the broad thrust of the book. Can you bring yourself to swerve enthusiastically on to a mid way course between pro- and anti-capitalist? Capitalism/money/the markets are not ‘The Answer’, still less are they gods – they are merely convenient tools to be exploited for the general good. If the final net product of our individual and collective existence is the accumulation of material wealth then everything starts to look bleak and pointless. I am sure that there is more to us than that. Lets aim higher and keep vulgar money in its place. I assert that the final net product of our existence is increasing knowledge of the physical universe – the highest places in our society need to be occupied by scientists and explorers. Management, finance, politics; these are the province of the latter day third echelon – cooks, clerks and latrine diggers. Take a look at the book ‘Prosperity without growth’ for some introductory thoughts on the matter. Perpetual growth (in its customary economic meaning) and resource depletion in a closed system such as this planet is incompatible with reason, no matter how clever or subtle we may become. Your position on nuclear power is open to debate too. For several reasons that are rarely discussed (and are not mentioned by you) someone, somewhere has to have nuclear reactors. On the other hand the number of reactors needs to be the barest practicable minimum. You focus too narrowly on the quantitative aspects of risk and make no mention at all of the qualitative risks. Our knowledge of genetics is as yet too sketchy and short term for final positions to be adopted vis a vis the risk of even marginally increased radiation exposure of biota. The whole of life on this planet is encoded in DNA (or RNA) which is vulnerable to all classes of radiation and there is no known lower limit of dose/response. When contemplating such fundamental elements it can only be good sense to invoke the precautionary principle as the first move. We cannot repair the basic dataset of the whole biosphere once it is corrupt. Please place a higher priority on reduction in consumption of energy and raw materials. Malthus was right – overpopulation has a cost but you do not address it. These are areas amenable to evidence based action. Is there a group in the Republic of Ireland organising to send copies to politicians yet? Pingback: The greatest threat to rational thinking and scientific progress is Heather Stevens. « I have no idea what I'm doing. 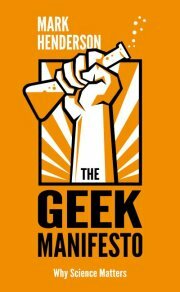 It seems like u truly know a lot pertaining to this specific subject matter and that exhibits as a result of this excellent post, named “About the book | The Geek Manifesto”. Pingback: Science Online hits Dublin « Science Calling! I think starting your own political party/ies (world wide) would be more effective… too much “corporate momentum” in the existing parties. But possibly a longer term strategy. The basic problem with politics is that the politicians are aimed at getting elected i.e. being charming to the majority of the population. They are not about running a country.